The Munchkin High Speed Bottle Warmer has a steam warming system. Because it heats by steam, this can warm milk and food quickly and evenly. This bottle warmer can warm a bottle in just 90 seconds. Unlike microwaving, this will keep all the nutrients in the milk. This product includes an on/off indicator, as well as an auto shut-off. The alarm will sound and the system will automatically shut off when it is ready. 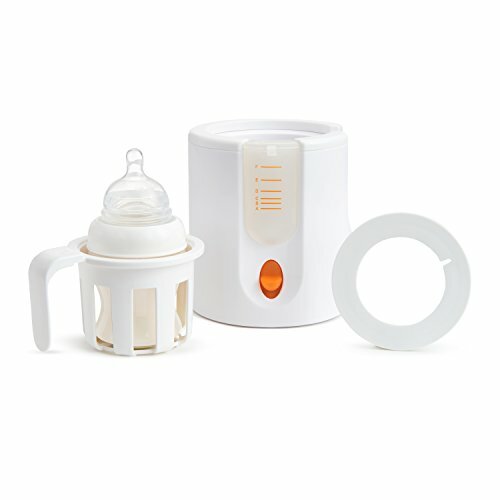 This bottle warmer comes with an adapter ring, which helps warm smaller bottles or jars of baby food. It also comes with a measuring cup that can be used to measure the water, as well as a lift-out basket. As of this writing there were 690 customer comments and 122 answered questions for the Munchkin High Speed Bottle Warmer. I've read through the customer feedback, and then condensed the results into this review. I hope that this helps you when shopping for a baby bottle warmer. "Heats fast but the amount of water needed is difficult to assess as I sometimes feed the baby different amounts. Takes a little trial and error but once it is figured out, it heats very fast which is needed for my hungry inpatient little one!" "This machine produces HOT steam, so make sure it isn't directly under your upper kitchen cabinets when in use. That steam could damage the bottom of your cabinets if you allow it to condensate under them." "If you need a bottle warmer, get this one! It does its job and it is very easy to clean up. Eventually, the insides will turn a little brown, but you can keep up with the cleaning and it will be like new." "I agree with other reviewers that the beeping is pretty loud, but we keep the warmer in the kitchen so it's not a bother. Our dog, however, is pretty startled by it!" "I love this bottle warmer and you can't beat the price." The Munchkin High Speed Bottle Warmer heats up fast and is easy to use. It produces a hot steam, so be careful to keep children and pets away and also don't place it directly under a cabinet. It is a easy to clean and beeps when ready. Some customers didn't like the beep because they felt it was too loud and that it could wake people who are sleeping if it beeped at night. This bottle warmer is nothing fancy but it does the trick.